This image shows NASA’s Phoenix Mars Lander’s solar panel and the lander’s Robotic Arm with a sample in the scoop on June 10, 2008. The image was taken just before the sample was delivered to the Optical Microscope. This view is a part of the "mission success" panorama that will show the whole landing site in color. NASA'sPhoenix Mars Lander is clinging to life and communicating daily with missioncontrollers though its power supply is quickly diminishing. Phoenix has communicated with missionscientists everyday since Oct. 30, when the spacecraft suddenlywent quiet after a drop in available power sent it into an inactive ?"safemode." 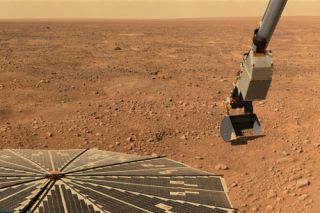 Thespacecraft is now in its sixth month on the Martian surface - double itsinitial mission - sincelanding on the red planet's arctic plains on May 25. Phoenix has beenscooping up samples of Martian dirt and the rock-hard, subsurface layer ofwater ice at its landing site and analyzing them for signs of past potentialhabitability. Phoenix is nearingthe end of its mission as the fraction of the day the sun spends above thehorizon shrinks at its arctic landing site. Dust raised by a storm last week,which contributed to Phoenix's shutdown, continues to block some of the littlesunlight reaching the spacecraft. Informationreceived by NASA over the past weekend shows that Phoenix is running out ofpower each afternoon or evening, but reawakening after its solar arrays catchmorning sunlight. "Thisis exactly the scenario we expected for the mission's final phase, though thedust storm brought it a couple weeks sooner than we had hoped," saidPhoenix Project Manager Barry Goldstein of NASA's Jet Propulsion Laboratory (JPL)in Pasadena, Calif. "We will be trying to gain some additional scienceduring however many days we have left. Any day could be our last." Missionengineers at JPL and at Lockheed Martin Space Systems in Denver, Colo., are attempting this week to send commands to be stored in the Phoenix?s flash memoryfor science activities to be conducted when the lander wakes up each day. "Weatherobservations are our top priority now," said Phoenix PrincipalInvestigator Peter Smith. "If there's enough energy, we will try to getreadings from the conductivity probe that has been inserted into the soil, andpossibly some images to assess frost buildup." Phoenix finished scoopingup dirt and ice samples late last month. The team filled one of the fourremaining unfilled ovens on the lander's Thermal and Evolved-Gas Analyzer(TEGA), which bakes the samples and analyzes their composition. Two more ovenswere closed without samples for background measurements and one was leftunfilled, Smith told SPACE.com in an email. The teamtried to use the lander's robotic arm to push a sample that was stuck into thewet chemistry lab, but it didn't go in, Smith wrote.